As tablets take the world by storm, MSI is leading the way in terms of R&D. This big name in high tech products is unveiling the latest additions to its WindPad Tablet Series at Computex 2011. They feature the latest, greatest power-sipping processors and a full array of I/O and expansion ports, so hooking up to your computer and multimedia devices at home and work is a cinch. MSI also joined forces with world-renowned fashion designer Jeremy Scott to design the looks of the MSI WindPad Series. Scott has an impressive résumé, having collaborated with big name celebrities, like Madonna and Lady Gaga, as well as sports product giant Adidas. This is his first time working with the high tech industry. Taipei—As big names around the world in PCs and mobile phones try their hands at tablet computers, MSI, which boasts innovative R&D capabilities, chic designs, and a cautious approach to market development, will be exhibiting its own wares, including the 10-inch WindPad 100A and WindPad 110W, at both Computex 2011 (May 31-June 4) and L607 at the Taipei World Trade Center in Nangang. Eric Kuo, associate vice president for global sales, MSI Notebook, points out that MSI's new generation WindPad Tablet Series includes WindPad 110W with AMD Brazos processing platform and Windows 7 OS as well as the WindPad 100A with ARM Cortex™-A9 architecture processor and the latest Google Android OS. Both tablets are equipped with all-new soft/hardware to satisfy your work and entertainment needs. 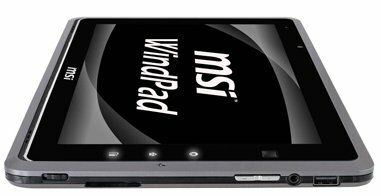 Mainstream operating systems: MSI's new generation tablet series include the WindPad 110W and WindPad 100A. The WindPad 110W features Microsoft's Windows 7 OS—ideal for businesses, because the prevalence of Windows and the enhanced application support vastly reduce the possibility of incompatibility issues. The WindPad 100A uses the latest version of the open-source Google Android OS for which new applications are being designed at unheard of rates. As a result, the WindPad 100A has no problem meeting consumer entertainment software needs. Cutting-edge fashion by Jeremy Scott: MSI went the extra mile to provide its WindPads with sophisticated looks, sheathing them in color film print to not only give them an extra touch of class, but to safeguard them from scratching and wear. So whether you're zipping along on the subway, kicking back at a cozy café, or enjoying nature, you can whip out your WindPad tablet with confidence. Some beautiful WindPads will debut at this year's Computex, including models designed by world-famous fashion designer Jeremy Scott who has incorporated cutting-edge style into MSI's cutting-edge high tech to create the perfect blend of fashion and technology. WindPad 110W: MSI's WindPad 110W packs AMD's Brazos dual core processor with AMD Radeon™ HD 6250 display chip for impressive processing and display performance, giving this tablet graphics processing capabilities on par with a discrete graphics card. Pop open the hood and you'll find 2GB DDRII of memory, 802.11 b/g/n wireless, a G-Sensor gravity detector, an ALS light sensor, and an SSD hard drive with up to 64GB of memory. Weighing in at 850 grams, it boasts six-plus hours of battery time—the longest of any tablet with Windows architecture. WindPad 100A: MSI's WindPad 110A features ARM Cortex-A9 dual core processor architecture and the latest Google Android operating system, giving it plenty of processing power. It also features 1GB DDRII of memory, 802.11 b/g/n wireless, G-Sensor, ALS, and an SSD hard drive with up to 32GB of memory to meet the entertainment needs of users. It tips the scales at 740 grams and offers more than eight hours of battery power. Complete array of I/O ports: The WindPad 110W and WindPad 100A tablet computers come equipped with a complete array of I/O ports, including an SD card reader, USB port, and mini HDMI slot, supporting the largest number of external devices, from printers and projectors to mouses, keyboards, and flash drives. And if you're looking to kick up your multimedia experience a few notches, you can connect your tablet to any size HDTV screen or surround sound stereo. Wide screen, dual cam lenses double your visual pleasure: The WindPad 110W and WindPad 100A tablets have 10-inch, 1280*800, rich color, IPS wide-screen displays. Not only are the screens completely viewable from every angle, they provide high resolution video, making them ideal for such applications as graphics work, surfing the Internet, and checking out photo details. These tablets also come with dual cams, one on the front, and one on the back, so whether you're shooting a video, taking pictures, or using them in concert with the mobile communication software, you can engage in high-quality conference calls with business associates, friends, or family anytime, anywhere. SRS wrap around sound: The WindPad 110W and 100A come with new generation SRS PC Sound™ wrap around sound to expand the overall sound field, so whether you use the internal speakers, external ones, or ear phones, you get an unprecedented, natural, true-to-life surround sound experience when you finally get a well deserved break from your school or office work. MSI Easy Face biometric software: The WindPad 110W tablet computer features MSI's own facial recognition software which works in concert with the high definition webcams to protect data biometrically. It employs your unique facial features to remember your passwords, so you don't have to. MSI EasyViewer photo manager: The WindPad 110W comes with EasyViewer photo management software, so you can use your finger to enlarge, reduce, and rotate photos. Sharing photos with friends and family was never easier. Office Starter 2010: The WindPad 110W comes pre-loaded with Microsoft's Office Starter 2010 word processing software, including Office Word 2010 and Office Excel 2010, making your tablet a mobile office. What's more, in order to meet the needs of mobile workers, the WindPad 110W comes with Adobe Reader, so you can read, print, search, sign, and authenticate PDF files anytime, anywhere. It also comes pre-loaded with Adobe Flash Player to maximize your multimedia experience. Touch control micro-vibration sensor: The WindPad 110W and 100A tablets sport a virtual keyboard design, so you don't have to relearn how to type and when you're typing on the screen, a micro-vibration function lets you know that the tablet recognizes that you have hit a key. The micro-vibration feedback makes typing more natural and faster as you don’t have to retype characters that weren't recognized the first time around. Easy one-finger control: The WindPad 110W sports MSI's own Smart Tracker, so you can grip both sides of the tablet and use small finger movements on the hotkeys on the right side of the tablet. Because you can use both hands, your wrists won't feel discomfort no matter how long you use it. In addition, the user friendly SAS hotkey performs the traditional role of the "Ctrl+Alt+Del" combination to open the Windows Security Window. MSI's own O-Easy interface offers easier management and use of frequently used functions and software, including turning on/off/adjusting screen brightness, volume, webcam, wireless, mute, and standby mode.